I spent much of today piecing some 'littles' ready for adding some embroidery. These will be crazy quilted postcards when they grow up. Since I took this picture, I've pieced some more blue and some green ones and there are pink, yellow and ivory ones in the plans. I may wish I hadn't started so many, but they should work up fairly quickly. Right now they look rather scruffy, but I promise they will be MUCH better once I'm done. Today's quote.... "You can never do a kindness too soon for you never know how soon it will be too late"
and some ribbons from my stash. Makes a little toy for a baby. Your quote for today... "There is nothing wrong with having nothing to say, as long as you don't insist on saying it" (found in my mother's collection). the new wee one will be a boy. Just a little announcement - Kathy Shaw has just opened registrations for her ICQC-101 (Design Plants & Block Piecing) online FREE crazy quilting class. Go HERE for further information (better hurry though, she's only taking registrations until midnight April 28th!). Or in dear Nature's solitudes. With me and never care a hang. And find me still - Oh, not so worse! The cussedness of all the rest. That you have not sins of your own. 'Twould cause you to falter too. sewn up, ready to put onto the pillow). But it won't be today - it's snowing!! You can click to embiggen the pictures if you'd like. to do one for Halloween!). entire series so you can see them all together. If you plant for a year - plant grain. If you plant for a century - plant trees. If you plant for eternity - plant ideas. Here you can see that I've added two little seam treatments - one is between the grass and the sand - a row of whipped running stitch; some lazy daisies, straight stitches & tiny little beads. The second seam moves to the right, close to the water....two rows of running stitch, woven on top with matching thread. I think the addition of the row of pink beads certainly helped (and, even better, I had exactly the right amount!). In hindsight I wish I had appliqued the heart in a contrasting fabric (perhaps lace). I still could have done that, however I didn't want to have to remove the silk ribbon flowers. Silk ribbon is precious and I don't like wasting it! So, now what do you think? Another quote from my mother's collection... "Don't keep the milk of human kindness too long in cold storage. It is apt to decline in quality"
....not only is the light gone, but there wasn't a single stitch added to my pillow today. 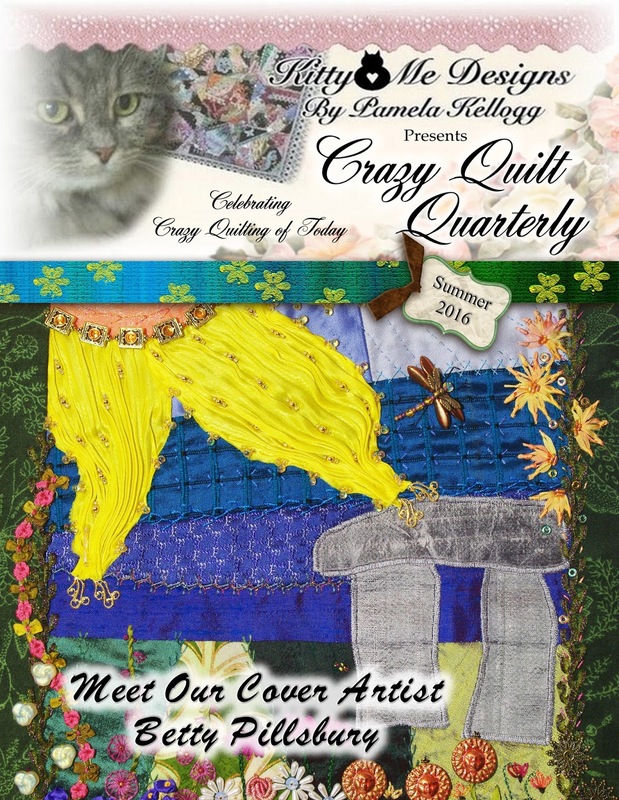 I spent the afternoon writing an article for a future issue of 'Crazy Quilt Quarterly' along with working on editing Kathy Shaw's next book ('Crazy Quilting - Volume 2 - Ribbon Embellishments') which will soon be available. Mumble # 1 - There's a cute little organizer tutorial for holding embroidery supplies HERE. Mumble # 2 - Salley Mavor (of 'Felt Wee Folk' fame) is showing her newest piece focusing on women's head coverings. It is absolutely amazing and you can see it (and read more about it) HERE. Wow!! Mumble # 3 - Gerry Krueger has posted two free patterns for birds HERE and HERE (one link is a swallow and the other an owl and some baby birds). Mumble # 4 - Some of you will remember that my favourite embroidery frame of all time came from the plans shared by Kathy Shaw HERE. If you check out the post HERE you will find that Boud has taken Kathy's plans and made a great variation. Mumble # 5 - If I were to lose a little bit of weight, and re-arrange my body somewhat (well, maybe a lot! ), I would love THIS crocheted top!! Mumble #6 - For those of you who enjoy making dolls, perhaps you'd like to have a look at THESE online classes. There has been a little more progress on the pillow cover. What you see in the photo today isn't complete, because I've added to it since I took the picture. Both of these seams are in the sky section. There is a lot more stitching yet to go in the sky, so you'll have to stay tuned to see what happens next. Actually, I'll have to stay tuned too, because I haven't a clue what I'll do next either!! - For those of you who like eco-dyeing, there's an interesting article HERE. - I am not suggesting that any of you need help with cleaning (nor am I suggesting that you take time away from your creative pursuits to take part in such activities), however if you really feel you must, you might like to check out the suggestions HERE for hard to clean areas. With some chance of touching par. Than a might-have-been, by far. But a has-been was an are. I must admit our mailman is a grump - he snarls his way through his day and most of us try to avoid him like the plague. However, when he brings such delights to my mailbox as he did last week, how can I not have a teeny bit of love in my heart for him. First of all - he brought a wonderful mysterious-looking box in the mail with the return address attributed to Vicki Boster. Oh happy day!! I already knew what might be in there, but I didn't know just how beautiful it truly is!! Vicki is renowned for creating the most incredible birds' nests with much of the proceeds going to charity. I have admired her work from afar for a very long time so imagine my astonishment and delight to now be the proud caretaker for my very own nest! Look at how prettily it was packaged! little nests filled with eggs. So pretty! so thank you Vicki for allowing me to use it. Do you see the teeny little eggs nestled in the nest? 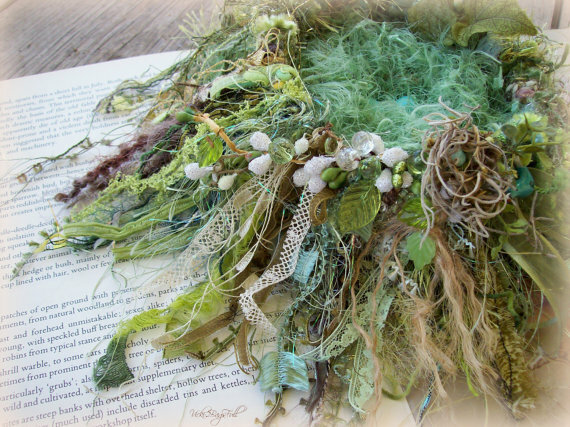 And all the wondrous fibers and yarns and details that she includes? Last week the mailman also brought another parcel to my mailbox. Tonia of 'All Thingz Sewn' wanted to re-home her collection of 'Tilda' books and chose me to be their caregiver. I was more than delighted to do so! I have long admired the Tilda dolls and have wanted to make one...or more ;) .... and now, thanks to Tonia, I can! Thank you so much Tonia!! Alas, I have no pictures to show you of any progress on the pillow cover. The weather turned beautiful over the weekend and I didn't get any stitching done. Having a picnic in the park with our grandson sort of took precedence. How could that be? "All of us are always going to do better tomorrow and we would too, if only we started today." I wanted to include the word 'summer' somewhere, and after much thought over both using the word and also trying to fill that space to the left of the beach sign, I decided that maybe a heart might just be the answer. I love summer the bestest - so a heart seemed fitting. Ribbon roses, gold metallic thread and a teeny little butterfly button completed the section. That left a little bit of 'grass' so I added the star-shaped sequins topped with black star beads on the seam and then the butterfly charm and his flight path was added. There's a sweet little crocheted doll pattern available on THIS site, and if you would like to check out a fun Mandala Madness Mystery Crochet-a-Long that's happening go HERE. I found this one via Cyra of Free-Form-Stitching and you can see her project so far by going HERE. Sure wish I had time in my schedule to be able to play along with this one! Elizabeth of Sew In Love has written a very thought-provoking post about manners in blogging. It's well worth reading and being reminded that we should always strive to be kind. You can read that HERE. Further on what Elizabeth has said, perhaps this quote would be fitting to share today.... "We cannot control the tongues of other people, but we can watch our own" and there's also this one: "To rule one's self is the first duty of every man"
There was limited time for stitching today, so all I accomplished was this little cross stitched sign, pointing the way to the beach. Here's a couple of things you might find interesting. Go HERE for doll classes and information on doll making. 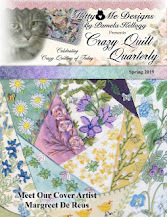 And, there's been a new issue of the free 'Quilt Social' magazine released and you can find that HERE. Well worth having a look - there's lots of quilting information and tips. A quote, from my mother's collection - "Hang on! Hang on until you get to the end of your rope, then tie a knot in the end and keep on hanging on"
It's hard to take a picture of metallic thread, but trust me - the 'waves' in the water were stitched with silver metallic that gives a good effect overall. Here's another of the poems I found in Mom's book. In my quest to discover who the author might be, the only reference that came up was that this poem was penned by Vida V. Young and was published in 'The Canadian Statesman' newspaper, dated Oct. 11, 1934. This makes complete sense because that's the time period my mother was in the tuberculosis hospital. Till months had quickly passed away. The house is empty now. And loved her more each day. My heart is aching so. Dark clouds may drive away. Are penned, alas, too late. Would lead her feet astray. Has reached the depths of sin. You breathe the words "Too Late!" Over the weekend I finished the vine section on my pillow cover. I also added a little school of fish. I added some 'waves' in the water closest to the land, but hated the look, so frogged those. I will show you tomorrow what I did instead. This afternoon I stitched a floral section on the lower right and when I removed the tissue paper pattern I hate that too. I very stupidly forgot that it should be on the level with the bottom of the posts the seagull is perched on. So....there's more rippit-ing in my future! Unless I can add more flowers. Today I have another poem I found in my mother's papers, unfortunately I don't know the author. I do know it wasn't my mother. A face within it's light. More worthwhile than the goal. The hopes of one true friend. 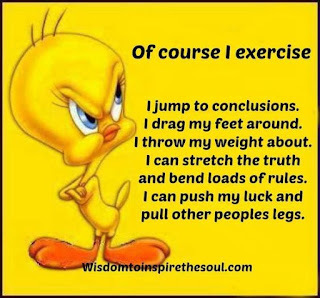 Aha - and I'll just bet you're dying to know my secret aren't you? I'm happy to share my diet with you, because it's painless and it really does work. Don't we all like that sort of diet? There's a minimal amount of exercise involved with this one too, so that makes it even better. Right?? - Pam Kellogg has released an advance preview peep at the cover of the new summer edition (being released May 1st) of the 'Crazy Quilt Quarterly' magazine and you can see that HERE. She has also included a sneak peak at the contents page as well. A little birdie has been sharing with me that there are some big changes coming with the magazine and you will definitely want to stay tuned for those! - It's spring (at least it's supposed to be in this part of the hemisphere) and some of us might be thinking about spring cleaning. 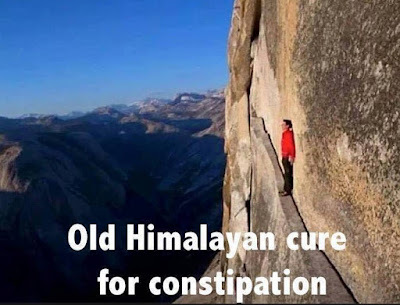 I know, to most of us that's akin to work and something to be avoided. However, maintaining your sewing machine is in your best interest and with that in mind, perhaps you might find THIS useful. I know this is a very odd angle to be taking a photo, but I wanted to share with you how I made the vine. First I drew the outline onto my fabric (white gel pen worked well for this). Then I used pearl cotton and a running chain stitch to embroider the design. I wanted the vine to appear thicker than just the chain stitch so I found some crochet thread in my stash and used that to whip the chain stitches, adding an element of depth to the design. Now I will add some flowers and I'll show you that next time. Now back to the diet! 1. Get up from your chair. 2. Walk into the bedroom. bend down as far as you can. 5. Pick up a large plastic tote. until tote is free of closet. 8. Pick up tote and return to sewing room. 9. Dump tote (and the yarn it contains) onto floor. up a ball of yarn. 12. Repeat as often as necessary. 14. Discard remaining, using method of your choice. Now, there, wasn't that easy? I didn't get any stitching done on the pillow cover yesterday so decided I would answer some questions that have arisen over yesterday's post. First of all, Val asked how I attach things like shells and such to my crazy quilts (sorry I can't answer you directly Val, but you are a 'no reply' so I have to respond here). I try to sew everything down to my pieces and use nylon beading thread as much as possible...or you can use dental floss if you feel it won't show too much. I avoid glue as much as possible simply because it tends to yellow and let go over time. If I do use glue, I use E6000. The real shells I used on this piece had little holes already drilled in them so they were easy to stitch down....if the item I'm using doesn't have a hole I try to drill them myself. 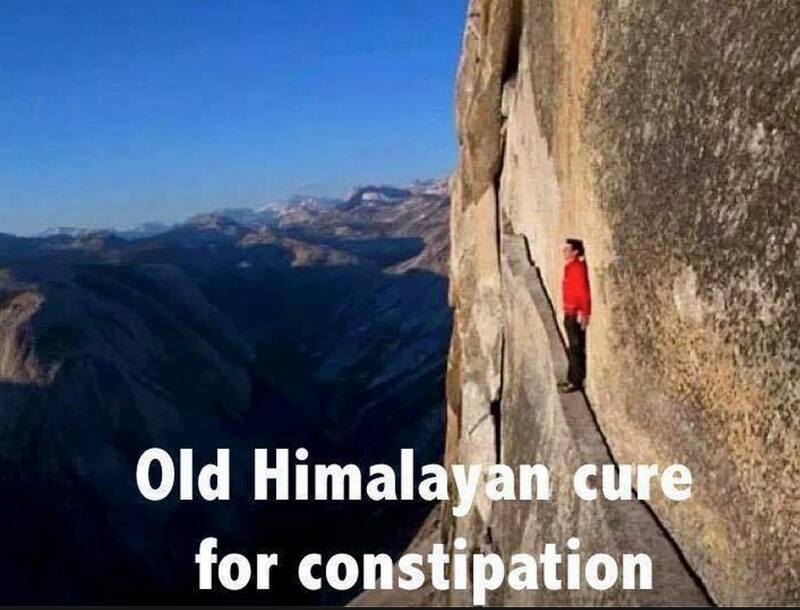 Anything to avoid using glue! If you simply can't get a hole into an item, perhaps you can try just looping threads around it in order to hold it in place. In that case I try to use a colour of thread that blends as closely as possible so that it doesn't show too much. Another little hint as well - I try to knot my thread after stitching on pretty much every element, just to be sure that if something does let go in years to come, the entire lot won't follow suite. There are several different ways you can orient this frame, depending on the project you're working on. I'm sure there are better pictures available on Kathy's site, so have a look there. He's sadly carrying his own tail and looks so sad. Poor thing - I must put him out of his misery. Who knows, maybe he might even be treated to some 'pretties'. Edited to add: The bunny measures about 8" tall and the pattern can be found HERE. Age is a quality of mind. Sorry about the poor quality photo - it's dull and yucky (and snowy) here again today. There's not a lot that has changed on this, with the exception of the drift of shells and beads and the addition of a teeny tiny little white sailboat on the horizon (an earring in a previous life). Today the quote, found among my mothers things, is this....."Remember when you are up against an apparent impossibility, you may be on the edge of the most wonderful discovery you have ever made"
As you can see, there have been a few more additions to the pillow cover. There are two sailboats, along with a fence with flowers (all done using cross stitch on waste canvas). I also added a pretty trim along one of the water seams (thank you Pam!!). Sails smoothly across the bay. Are showing in the trees. But in my heart a ray. In our ship of dreams will sway. And hold within my soul. In case you are wondering - the perspective is 'off' between the sandcastle and the seagulls on purpose. I'm hoping to give a sense of depth to the scene by changing the scale of the gulls to appear in the foreground. 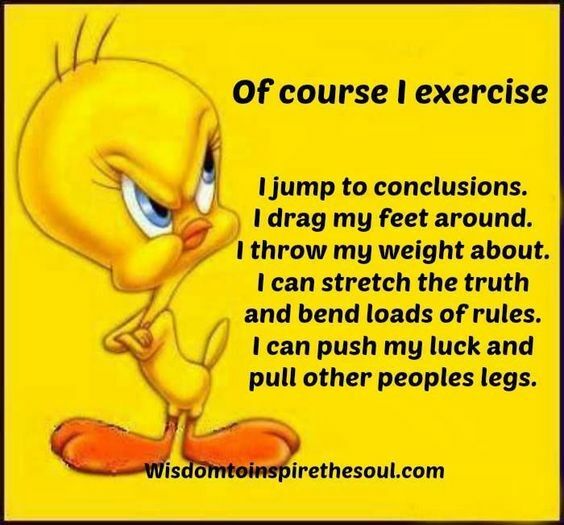 At least such is the plan! - If you like kitties, there's a free download HERE for those who work with paper. So cute!! - If you like suncatchers, you might want to check THIS out. Would be fun to do with teens too! 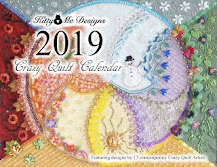 - Kathy Shaw has announced that she's planning to offer her free intermediate crazy quilting classes at least once more. You can find further details HERE. - For the cross stitchers out there, HERE's a wonderful Pooh Bear pattern! - Through another blogger (http://www.sewwequilt.com) I found an absolutely wonderful photographer - Vivian Maier - and you will enjoy seeing her amazing photographs HERE. Be sure to check through her portfolios! I certainly thought of this one when we awoke to all that snow this morning - and apparently more to come.